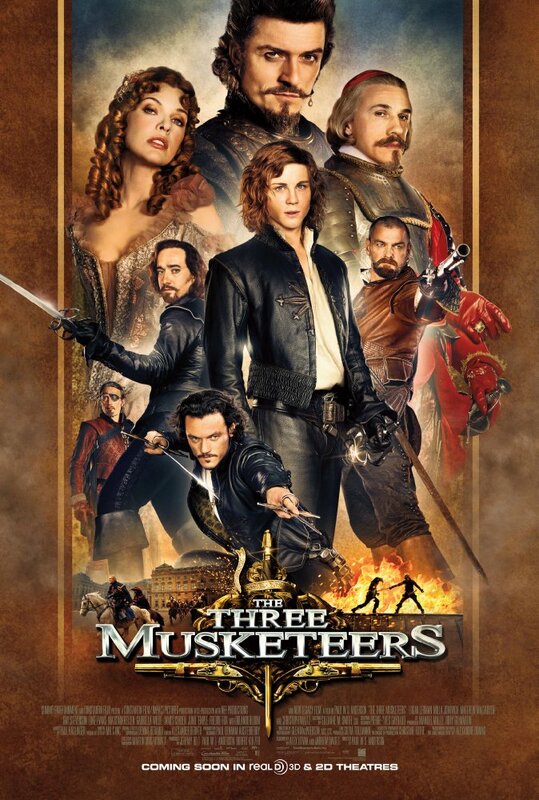 Also, “3 musketeers” opens in the US 2night! Do you think ppl know abt the movie? Ask your friends! Do they know it’s a fun family film? I think “summit” hve swept “3 Musketeers”, a grt family adventure film, under the rug in the US. Shame on them. SHAME ON YOU “SUMMIT”. Apparently, as I posted per Mr. Moviefone, Summit didn't hold any press screenings for the film. That's usually the kiss of death, indicating the studio knows the critics aren't going to give the film a thumbs up. A look at Rotten Tomatoes shows, that like Mr. Moviefone, the critics by and large do HATE this movie. But I feel bad for poor Milla and her hubby, the director, Paul W S Anderson and the movie opened pretty poorly so I searched for and found the following positive review from Jaime Christley at SLANT. Hey, every dog has its day! And you know what, maybe it is a fun family pic; the trailer looks like it might appeal to the preteen and tween set. And the cast is fairly stellar: Besides Ms Jovovich there's Luke Evans, Logan Lerman, Christoph Waltz, Matthew McFadyen and Orlando Bloom. Take a look, see what you think. "It seems like only yesterday that Paul W.S. Anderson and Milla Jovovich were the poster children for "hotshot kids" in their respective fields, Anderson grabbing the reins of a big-screen video-game adaptation (Mortal Kombat, the success of which effectively changed the way the industry looked at console games as potential source material) while the whole world was either raising a glass to Quentin Tarantino or showering Forrest Gump with Oscars, and the wraith-like Jovovich, a modeling icon by her teens, leapfrogging from Two-Moon Junction to Kuffs to The Fifth Element, never quite hitting it off with critics, but ascending like a star nevertheless. Fifteen or so years later, the two are married (since 2009), they've built the ongoing Resident Evil franchise together, and they still can't get no respect. This is ironic because, in that time, while no one was looking, Anderson became a real filmmaker, and Jovovich became a real actress. Opening against a Paramount cash cow (Paranormal Activity 3) without a single press screening, you don't have to be Irving Thalberg to figure that Summit Entertainment considers The Three Musketeers to be a $75 million-dollar loss leader, a tax write-off appetizer to prepare for the main course of what gurus of such things are saying may be one or two of the highest-grossing franchise entries of all time (the bifurcated finale of the Twilight series). This is, in industry terms, pretty much the same thing as folding your hand before you post the big blind in poker. Early in the film, I found it hard to blame Summit, as Alex Litvak and Andrew Davies's dialogue is front loaded with howlers on par with Luc Besson's gleefully anachronistic Joan of Arc (which also starred Jovovich), mostly having to do with the handling of headstrong Gascony bumpkin d'Artagnan's calamitous arrival in Paris. Anderson has never shown an aptitude for comedy, except visually, so even the most sympathetic viewers may find themselves mentally willing these early scenes to be done with, and quickly. A moment's patience is soon rewarded by Anderson's vast store of rich, intoxicating imagery. Taking for granted that the film plays fast and loose (to say the very, very least) with the Dumas classic, Anderson customizes the old warhorse as if it was one of the muscle cars in his underrated Death Race, adding Resident Evil-style booby traps and slow-motion, bird's-eye-view action shots, impossibly timed hair's-breadth escapes, and a high body count. In addition, this must be something of a coming-out that Anderson has long been harboring a Miyazaki crush, with giant, steampunk airships battling over incalculable altitudes. Anderson is also a natural with 3D, making him like something of an exotic bird among directors. It certainly doesn't hurt that he's always had a knack with building widescreen spaces with a sense of depth, and using that talent to construct spatially coherent action sequences. (D'Artagnan's final duel with Rochefort is the best bit of swashbuckling these eyes have seen on the big screen in ages.) 3D in The Three Musketeers is most artfully used in non-action scenes, creating a virtual world of 17th-century France that is as breathtaking, in its way, as in James Cameron's Pandora. That Jovovich, Anderson's Anna Karina, should be one of the best things in the film may come as a surprise to anyone who only remembers the way Besson, to whom Jovovich was briefly married in the late '90s, brought out her worst tendencies. Best-known as Resident Evil's un-killable Alice, she's gone from an all-purpose whiff of cotton candy, albeit with a siren's eyes, to an estimable screen presence, even if many critics need something unambiguously dramatic like John Curran's Stone to get their attention. Turning in a tough, yet subtle performance in David Twohy's A Perfect Getaway, she proves a natural comedienne here, sexily dancing through invisible razor wire, upstaging Christoph Waltz, and just kind of getting away with absolutely anything. The Three Musketeers is an easy target for critics: With no effective marketing primer from the apathetic Summit, un-presold audiences are left to their own devices not only with a period piece, but one that's laden with unconvincing dialogue and a ton of strange ideas. On balance, Anderson has never made a film that's been met with good notices, and he isn't the kind of director who seems to care too much about smart scripts. After the bumpy first scenes with d'Artagnan, however, if you consider yourself an open-minded viewer, you'll find yourself slowly overcome with the opium dream of Bourbon-era France, rendered in immersive depth, and Anderson's over-caffeinated absurdities, to the point where you're open to any crackpot idea, just so long as it dazzles. And it dazzles"
Okay, Mr. Christley, if you say so.